Tandem Stills + Motion is a leading media company that unites photography, film production, and technology with the outdoor and adventure marketplace. Tandem works in the genres of nature, conservation, science, exploration, and environmental education. We are a full-service production company working in television, theatrical, and giant-screen cinema. One of Tandem's state-of-the-art editing suites. Employing the latest in digital technology, Hidden Pacific will transport audiences around the globe and into the vibrant world of America's Marine National Monuments. Directed by award-winning filmmaker, photographer, and conservationist Ian Shive, Hidden Pacific is a pioneering film profiling the Pacific Ocean’s protected and remote national wildlife refuge islands and marine national monuments. Filmed with stunning 6K and 8K digital cinema cameras, audiences will have the opportunity to experience these public lands from the sky, on land, and deep underwater. Mix session for Hidden Pacific. Capturing these incredible stories was only half the fun of putting Hidden Pacific together. After six months of shooting on four different remote islands we began the challenging process of sorting through more than 130 hours of footage. 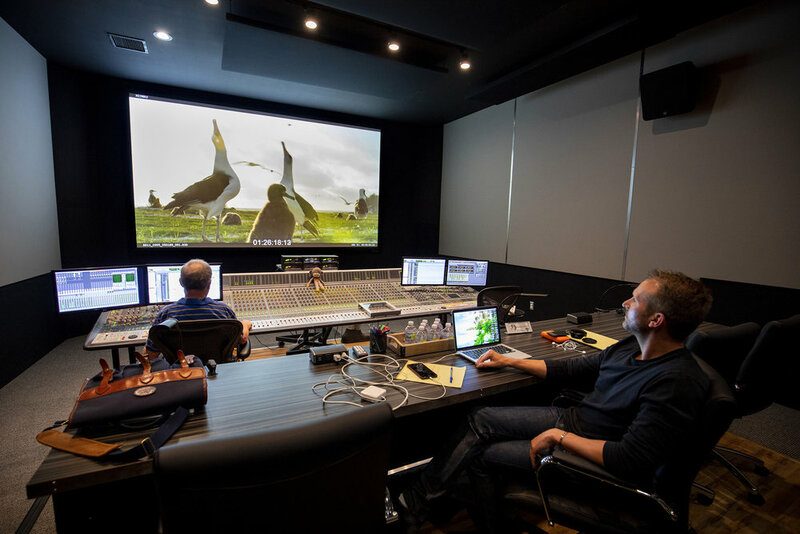 The film truly comes to life in post production as we combine the beautiful original score by Cody Westheimer (Journey to Space IMAX) with the storytelling of editor Ian Maliniak (Midway: Edge of Tomorrow) and a fantastic array of nature sounds captured in these pristine environments. Since 1997, Giant Screen Films has established itself as a pioneer in the large-format industry, producing and distributing films that push the boundaries of the medium. Through the magic of immersive sight and sound technologies, GSF’s productions challenge the imaginations of children and adults, offering an inspiring perspective on the world and an unforgettable theater experience. Meaningful educational collaboration and partnerships extend each film’s impact far beyond the theater. The company is recognized as one of the world’s leading and most active large-format producers and is based in Evanston, Illinois.